If you’re going to call your car the “Superfast” you’d better make sure it is actually pretty fast – or at least looks the part, and this one does. The 500 Superfast was the culmination of nearly 15 years of development of Ferrari’s “America” line of cars that began in 1950 with the 340 America. The 500 Superfast was a direct evolution of the 400 Superamerica. It is powered by a 5.0-liter V-12 good for 400 horsepower, which was a decent jump over the car that came before it. The body, designed by Pininfarina, is super sleek like it just cuts through the air. When new, these cars cost an exorbitant $15,000 and many of them went to royalty or celebrities. This one didn’t but it was sold new in California, where it has spent a majority of its life. The restoration dates to 2005 and is Ferrari Classiche certified. Only 36 examples were ever constructed and this is one of just 28 in left-hand drive configuration. It should bring between $2,800,000-$3,200,000. Click here for more info and here for more from Gooding & Company. 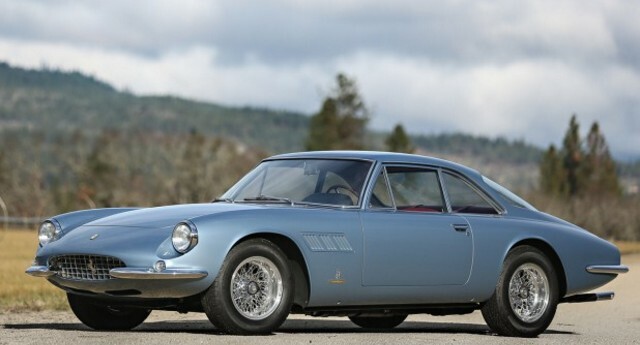 This entry was posted in Uncategorized and tagged 1965, 500, auctions, cars, classic cars, ferrari, gooding & company, superfast by classiccarweekly. Bookmark the permalink.